This article was originally printed in Piko Wholefoods Co-operative newsletter, February 2001. Piko granted us permission to reproduce it for our newsletter. Thanks, Piko! Why are figs so good? Is it because they are sun grown, sun ripened, sun dried and sun filled? Perhaps, but add to this the following and you have a snack and a food that deserves to be one of the essential foods in your diet. Figs are up to 1000% higher in calcium than any other common fruits – 133mg in 100g. Figs have the highest dietary fibre of any common fruit, nut or vegetable. Figs have a high content of plant protein, nearly twice as high as other dried fruits and over ten times that of most fresh fruits. Figs are loaded with natural food energy in the form of easily digestible natural sugars such as glucose and fructose. Figs have a higher overall score in minerals and trace minerals than other common fruits. Figs have a natural humectant that extends their shelf life and baked life. Figs are virtually free of cholesterol, fat and sodium. So, figs have a role to play in the health of the bowels. They have a detoxifying action and cleanse the intestines. They are used to treat hemorrhoids and polyps in the colon. They are good to prevent and relieve constipation. Figs also moisten the lungs. Chinese medicine recognises figs as toxin neutralisers. 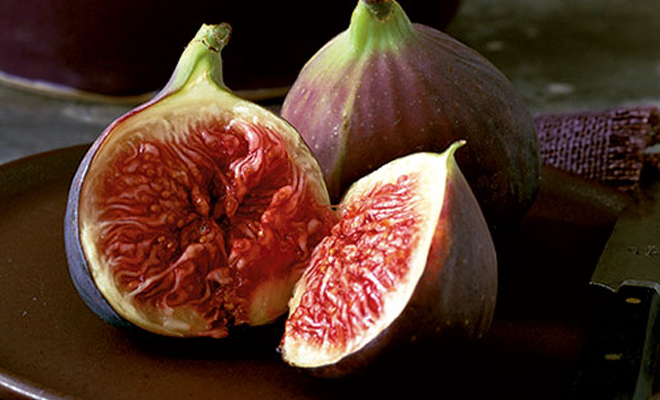 One of the most alkalising foods, figs can help balance the acid that forms from diets rich in meat and refined foods. Figs contain significant amounts of the enzyme ficin, which is a digestion enzyme helping with the digestion of proteins especially. They also contain the photochemical psoralene, which helps bring about beneficial results in skin injuries (a fig poultice will draw infection to a head), in the removal of dead skin tissues (i.e. for cosmetic use in facial scrubs), and in vertiligo (a skin disease involving lack of pigmentation in patches of skin – figs were noted for this use in 4000 BC!!). They also contain the phytochemical benzaldehyde, which has had some positive results in the prevention and treatment of cancerous tumours. Enough science, try a fig for enhancing bowel action, for digestive efficiency and for sustained energy! Thanks, too, to member Toni McMullan for being the link: Toni frequented Piko when she lived in Christchurch and knew of their informative newsletter. If you know of any locals with an abundant fig tree, and who would be keen to sell to the co-op, be sure to let us know. Thanks for this article. I have just planted a fig tree…yesterday. hoping it does ok in my sandy beach soil. And I used to shop at Piko when I lived in Christchurch….left nearly 3 years ago.